It’s probably no surprise that the first ever “over-the-top” film premiere in Hollywood took place at one of Sid Grauman’s showplaces. Douglas Fairbanks’ film Robin Hood held the first such event in 1922 at Grauman’s Egyptian Theatre on Hollywood Boulevard. Being the crowned king of Hollywood (with Mary Pickford his queen, of course), Fairbanks set the precedent for subsequent events with this one. Chaplin decided to wait for a feature to start this tradition with his own films and so, his first premiere was held for A Woman of Paris in 1923 at the Criterion Theatre in Hollywood—a premiere he would not attend himself, but, as David Robinson notes in Chaplin: His Life and Art, glittered without him (318-18). David Robinson reports in his book on the premiere night at the Tivoli Theatre in London, in which the BBC tried a sort of experiment—to record “ ‘a storm of uncontrolled laughter, inspired by the only man in the world who could make people laugh continually for the space of five minutes, viz., Charlie Chaplin’” (358-9), an achievement that proved to be an historic moment in film and broadcasting history. In Berlin, the premiere was positively remembered for an unprecedented encore, when the film was rolled back (no pun intended) so that the “Dance of the Rolls” sequence could be enjoyed for a second time. Times and economics had changed by the time City Lights was to premiere in January of 1931. First of all, no one wanted to distribute Chaplin’s largely silent picture and so he was forced to go to great lengths in both Los Angeles and New York City to secure a venue for his film. In LA, he seized upon the financial ineptitude of H. L. Gumbiner, owner of the Los Angeles Theatre located downtown on Broadway. With Chaplin’s backing, the elaborately decorated theatre went up in five months. It was “anointed by a large sunburst over the lobby doorway to symbolize Louis XIV, the Sun King. Close by, angels guard each corner of the coffered ceiling, a nod to the theatre’s location in the City of Angels. A grand central staircase [led] to a crystal fountain, and beyond that, heaven itself . . . Anthony B. Heinsbergen’s trompe l’oeil murals climax[ed] the auditorium ceiling” (The Last Remaining Seats 43). “The proprietor had built a beautiful theatre but, like many exhibitors in those days, he knew little about the presentation of films. The picture started. It showed the credit titles, to the usual first-night applause. Then at last the first	scene opened. My heart pounded. It was a comedy scene of the unveiling of a statue. They began to laugh! The laughter increased into roars. I had got them! . . . Then a most incredible thing happened. Suddenly in the middle of the laughter the picture was turned off! The house lights went up and a voice over a loudspeaker announced: ‘Before continuing further with this wonderful comedy, we would like to take five minutes of your time and point out to you the merits of this beautiful new theatre.’ I could not believe my ears. I went mad. I leaped from my seat and raced up the aisle. . .” (330). While Chaplin missed premiere nights in both Paris and Berlin, much to the consternation of his fans in those cities, he was to attend premieres of the film in other smaller venues, such as Nice and Biarritz. The program for the premiere run of the film in Paris at the Theatre Marigny is worth mentioning, however, because it offers the first visual link between The Little Tramp and Mickey Mouse, for the Shell Oil Company’s advertisement illustrator incorporates the two in a several-page-long illustration that runs throughout the booklet. Later premiere nights also had their noteworthy moments. The premiere of The Great Dictator in New York City on October 15, 1940 was attended by Chaplin and Paulette Goddard (having arrived separately from each other) and his remarks following the film included his only reference to Paulette as his “wife.” It was also the only premiere that required engaging two side-by-side theatres because of viewer demand (the Capitol and Astor Theatres). The premiere of Monsieur Verdoux in 1947 was a completely different experience, however, and noteworthy because of it. Followed the next day by his butchering at the hands of the New York press, the film’s premiere on April 11th was supposedly peppered with hostile audience reaction. Even the presence of Oona and Chaplin’s on-again off-again friend and business partner Mary Pickford failed to save the evening. The premiere of Limelight, of course, was marked by the re-entry permit debacle, and so proved to move the location of premiere nights to Europe—permanently. Chaplin was supported at the London premiere of Limelight by his young family, his older son Sydney, Claire Bloom and Princess Margaret. 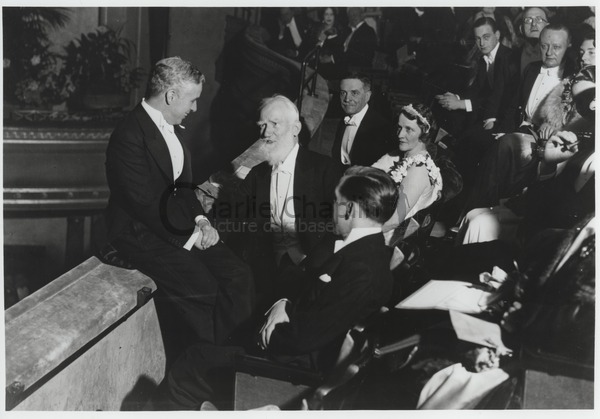 This premiere started a trend for the remaining premieres of Chaplin’s career in that the occasion was a charity event—this time for The Royal London Society for Teaching and Training the Blind. 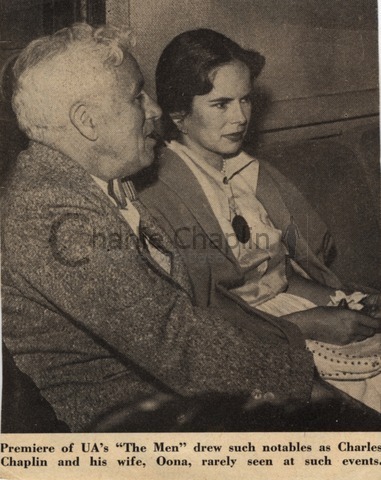 Press clipping: "Premiere of UA's "The Men" drew such notables as Charles Chaplin and his wife, Oona, rarely seen at such events"
It’s clear from newspaper research that simply attending one’s own premiere was not enough; a star of any status had to be seen at other such events as well. 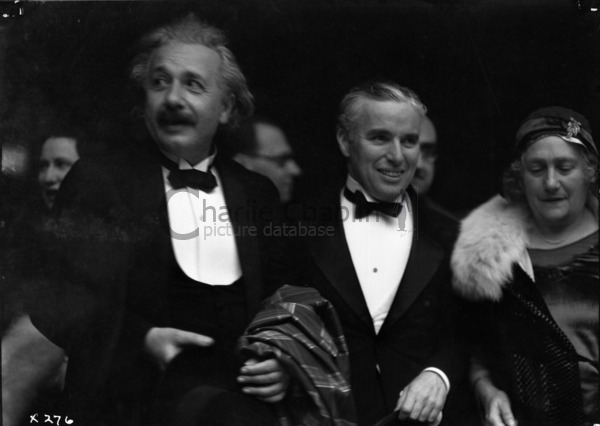 It seems that Chaplin’s appearance at others’ premieres was often taken as a sign of approval and his attendance was often recorded through photos or newsreels that were accompanied by his personal reaction to the film. In the hoopla surrounding Scorcese’s The Aviator, for instance, Turner Classic Movies showed Howard Hughes’ Hell’s Angels on several occasions—always advertising it a week beforehand with a newsreel from its premiere night in 1930. And there he is, of course, accompanied by Georgia Hale and happily providing his approbation for the film, for all the world’s a stage, my friends, and Chaplin an unparalleled master of the game.